There are five links below for you to access right now. The first two are information about our Equipment Leasing Services at FranchiseLeasing.com. The third is a DFS leasing application. The fourth is our Credit Application in printable format. The fifth is the ON-LINE version of our Credit Application. These are all available to assist any prospective start-ups and existing franchisees that need a fast approval and funding to help their Business. This will help their cash flow and preserve their liquid capital. Our Lease amounts are $5K - $150K. We only finance to the Franchise Industry. Let us know if you would like for us to review your list of equipment/fixtures and custom design a leasing program (to make it easier and faster when franchisees need financing). ** JUST CLICK each of the 4 documents below TO DOWNLOAD. You will be prompted to OPEN and SAVE to your computer. To calculate what your monthly payment (Debt Service) would be on your franchise loan, and to properly help determine operating cash flow and business projections, simply plug in the loan size, term (number of years) and interest rate. * Most start-up franchise loans are SBA (Small Business Administration). We also offer non-SBA loan programs. Terms are negotiable only for “stronger” borrowers. • note – currently the interest rate is 6% (2¾ over prime rate variable). Terms are usually 10 years on leased space and up to 25 years if Commercial Real Estate is included in the loan. Also, the minimum loan size is $100,000. 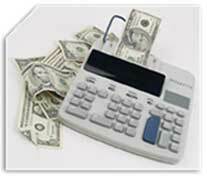 The results of this loan payment calculator are for estimation purposes only. at the terms entered from a financial institution. Figures can be adjusted to preferred amounts.